Today we released a new version of the Personal Gateway. This release includes many bug fixes and enhancements. As with the previous release, you do not have to uninstall the previous version of the Personal Gateway. It is an in-place upgrade. 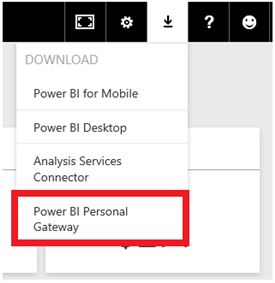 You can download the latest version of the Personal Gateway from within your Power BI account. Here’s a list of key enhancements and bug fixes we added in this version of Personal Gateway. Run Personal Gateway as an app when the user account cannot create windows service – Previously, if the user was an admin on the computer but still could not run a service we would attempt to run the Gateway as a service and Personal Gateway configuration would fail. In this release, we check whether a windows service can run with the user’s account. If not, we set up the Personal Gateway to run as an app, not as a service. Sync with M engine version in the Power BI Desktop – Both Personal gateway and Power BI Desktop internally rely on the Power Query M engine to do refresh. Now, when there is a mismatch in M versions in the Desktop and the Personal Gateway it may result in refresh failures. Starting this release, both Personal Gateway and Power BI Desktop will always include the same version of M engine. This will guarantee that if you use a new function or your M feature in your pbix file, refresh will work when you use the latest version Personal Gateway. Fix to local credentials overwrite bug – In this release we fixed the bug that removed the local service credentials when you upgrade the Personal Gateway. Fix to not start service if it is set to manual – Previously, even if you set the Personal Gateway service to manual start we would override it. In this release, we fixed this issue. Fix login pop-ups – With this release, we’ll not ask you for your Power BI login after your computer re-start. Time-out fixes – Refresh is a combination of multiple services and we used to have different time-out behaviors across different services. We have fixed the time-outs across various services. We’ll continue to release fixes and updates to the Personal Gateway. Stay tuned for more updates! You can learn more about the Personal Gateway here.